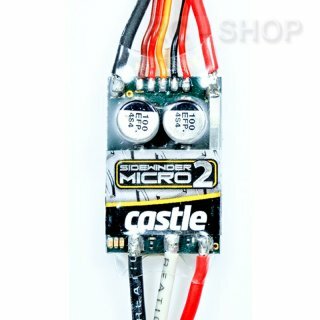 The Sidewinder Micro, our popular affordable Micro controller, now boasts all new updated circuitry and added functionalities. At Castle, our engineers are committed to taking full advantage of advancements in component quality and continuous improvements in software design. As a result, we are thrilled to introduce the Sidewinder Micro 2. The Sidewinder Micro 2 is perfect for 1:18th scale 2WD vehicles and smaller 4WD (up to 2 lbs.) such as the Team Associated RC18B2 or Dromida SC4 SCT. Whether you are converting to a brushless setup or simply needing more power than your current brushless power system is putting out, we have a combination to fit your needs. 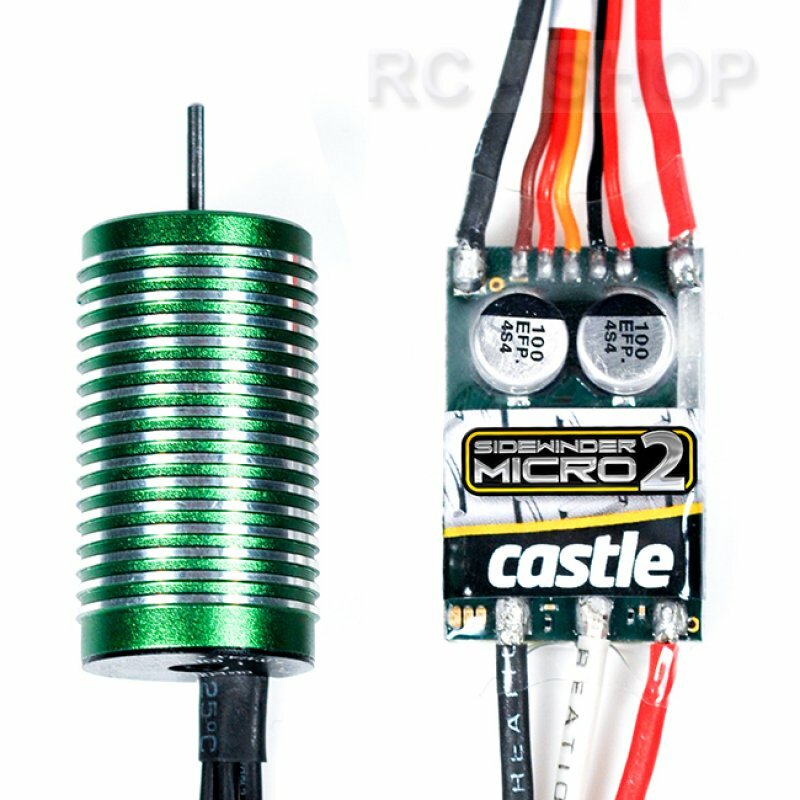 The Castle 20mm 0808 Brushless Motors are a perfect companion to the Sidewinder Micro 2 and are available in 4100Kv, 5300Kv, or 8200Kv packages. Not sure which one to use? No worries, our 0808 Gearing Chart provides recommendations to ensure a compatible and efficient setup. Improved Audible Alerts The ability to diagnose and resolve problems in the field are made easy as this ESC will communicate with audible tones when certain conditions are present. Alerts are present for start fail, voltage cutoff, radio glitch, over-temperature, over-current and excessive load detections. Improved Startup Updated circuitry and refined software makes for ultra-smooth starts! Transmitter Programming Manual programming settings include Brake/Reverse Type, Voltage Cutoff, Brake Amount, Drag Brake and Motor Type. Castle Link Programming With the purchase of Castle Link USB device, you will have access to the full programming suite of adjustable settings that tune and tweak your vehicle to your preferences, resulting in an incredible driving experience! Click here for the full list of Castle Link Sidewinder Micro 2 settings. Firmware Updates With the purchase of Castle Link USB device, you will have access to all firmware updates, including added feature sets released from Castle Engineering at no charge. Application: 1:18th scale RC hobby vehicles weighing up to 2 lbs. 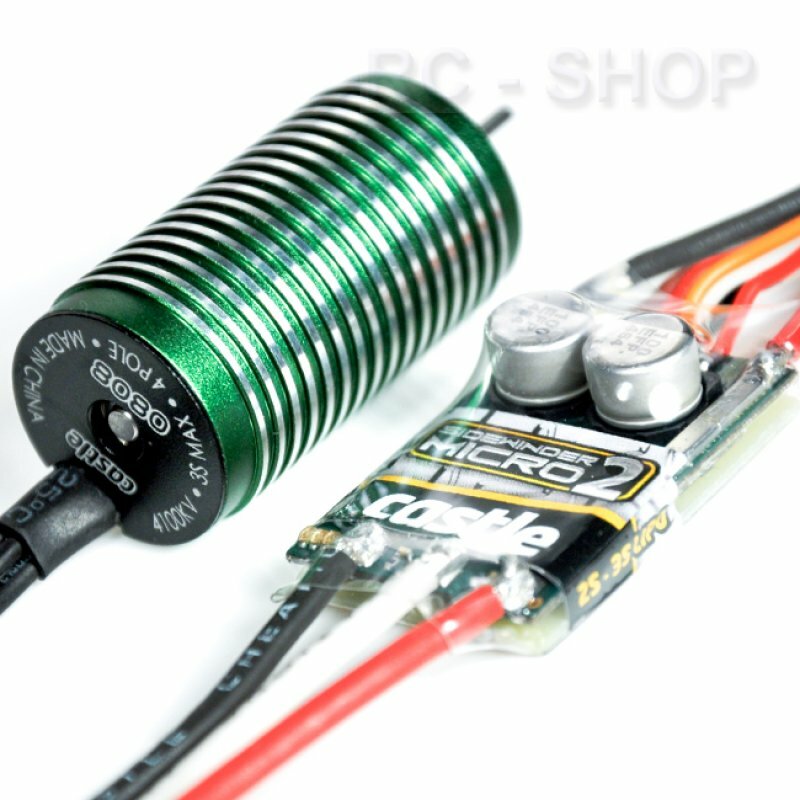 Connector Type: The Sidewinder Micro 2 has 3.5mm bullet connectors on the motor wires and the battery input wires are bare. You must add the connector of your choice to the battery leads. We recommend a high current connector rated for at least 40 amps. Inhalt: 1 Stk Regler, abgebildete Motore dienen nur der Demonstation und werden nicht mitgeliefert.